I find that I have written a surprising amount about Physician Assisted Death for someone who does not expect to be on the front lines of this new measure. I hope that the medical community can lead the debate, asking patients to consider how they want this new medical treatment to work. All the people with time to write are certainly drafting their views, but the debate also needs to be informed by what my colleagues are thinking, especially those on the forefront of palliative care and who work with patients with terminal and irremediable illnesses. 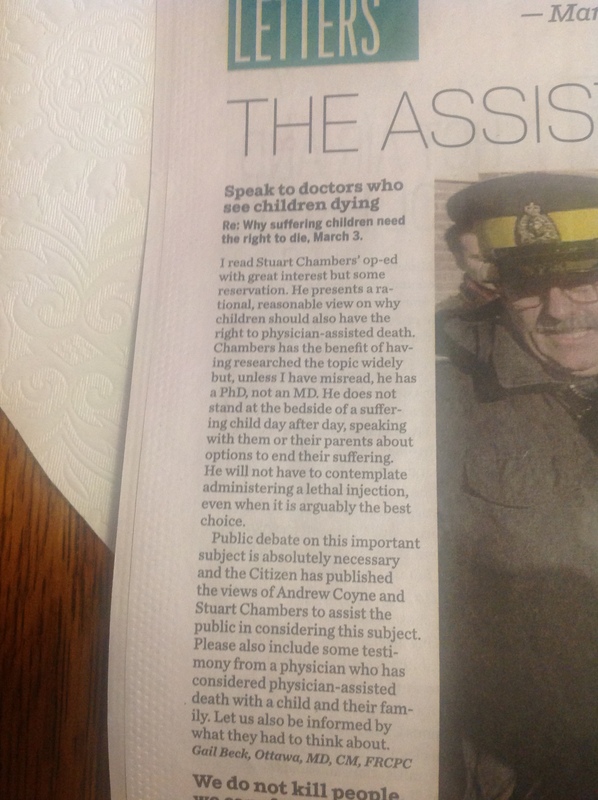 I wrote a letter to the Ottawa Citizen asking them to include some doctors’ views in the debate. This is a link to the letter.